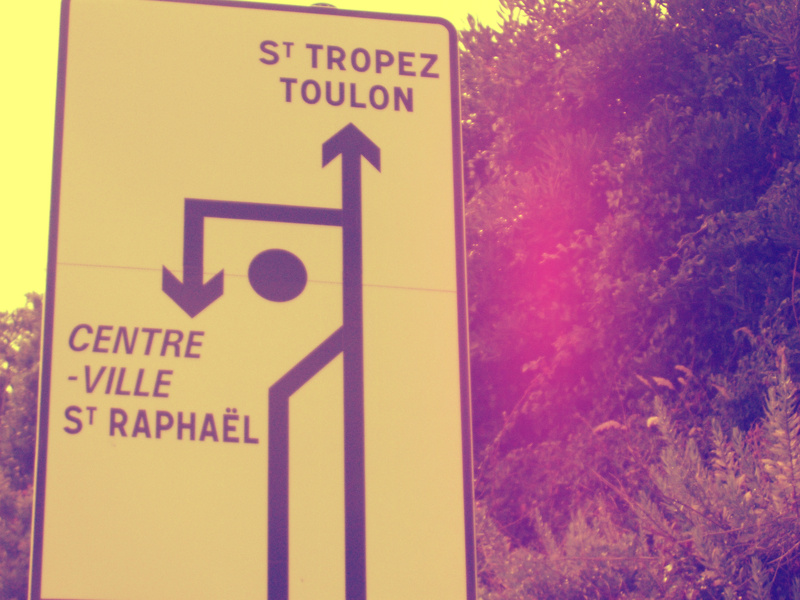 Had to hang out of the car window to get this shot of the road sign to St Tropez, but managed it! 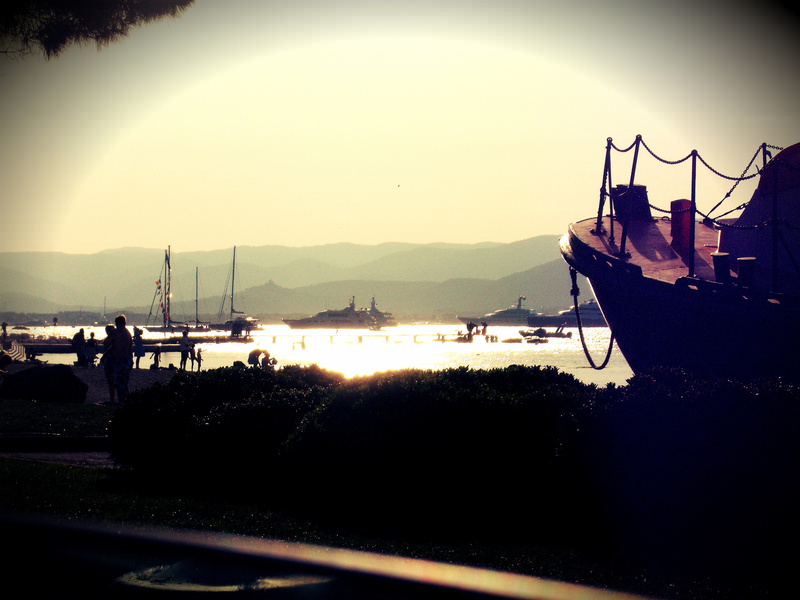 St Tropez! The playground of the rich and fabulously famous. When we arrived in St Tropez for a whistle-stop tour, it was hot. Achingly hot. That was a rather big warning that it was going to be busy busy busy. We were only in town for a couple of hours to ‘see’ St Tropez, rather than explore its back streets. We lived only an hour or so away that summer, and decided we couldn’t leave the area without visiting one of it’s most famous highlights. The first things you will notice about St Tropez are the cars, the boats, and the scooters. The boats clog up the harbor, with everything from battered dingies to modest pleasure boats, to yachts the size of cruise ships. The car parks are so full they look as though they are serving a large international airport, even though St Tropez itself is only a small seaside town. They boast all sorts of license plates, from far-off Denmark and Luxembourg to places just across the border such as Monaco and Italy. The scooters line up sometimes 3-deep on the pavements, some no more than battered motorized bikes with hair dryer engines, whilst others are gleaming Harley Davidson’s. Walking around the harbour in St Tropez is rather difficult, largely due to the large crowds of people who stand around where the yachts moor, eagerly looking out for a famous face. At one point we wandered past a boat that had a whole throng of people stood staring, cameras flashing away. We thought perhaps something was going on, maybe Kate Moss was about to step off for some shopping. But it just turned out that an elderly well-to-do couple were having their dinner. Not at the front of the boat where they would have peace and be able to watch the gently bobbing boats, no. They were sat on the back of the yacht, only about ten feet away from the roads of St Tropez, chomping away with a group of about thirty people staring at them. Exhibitionist much? This is what stuck in my mind as we appraised the yachts in the harbour: if there is one place you would not find the famous, it is docked in the harbour. 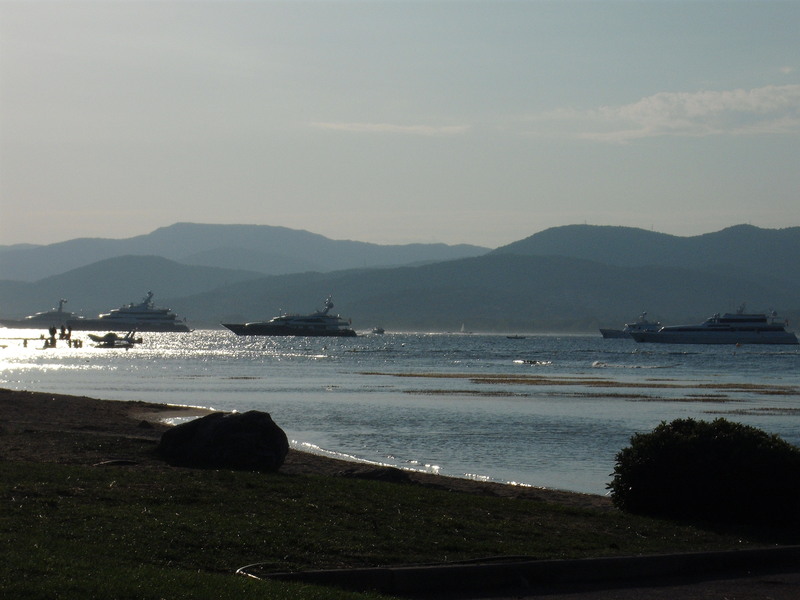 The A-list moor their yachts out in the bay and rarely step on St Tropez’s terra firma. Those who, like the elderly couple having their champagne dinner, dock in the harbour and play out their lives in front of the gawking crowds are usually those that have rented the boats out for a two week splurge, and enjoy the image of notoriety a yacht gives them. If you only have a few hours in St Tropez, do what we did; wander the harbour and admire the boats. Boats don’t necessarily equal enormous wealth, and there are a whole host of characters and scenarios to encounter. We saw birthday parties, hen dos, friends who had clubbed together for an unforgettable holiday, retired couples enjoying their new found freedom, local playboys flexing their naked torsos on the decks of their father’s fishing boats, and of course the crew. It seemed like every boat, no matter how big or small, had its own small, impeccably turned out crew. Dressed in white or blue with espadrilles, sunglasses, and an enviable tan, they cheerily sluiced the decks, unknotted ropes and politely rebuffed attempts by passing tourists to find out who was on the boat. If you fancy staying in St Tropez a little longer, my advice is to rent a scooter. From the looks of things, the locals who lived in the pastel coloured houses in the town all rode scooters for every occasion. Quite a few times we saw a terrified dog in a front or rear basket, or shopping bags swinging off the handlebars. It’s the only way to nip between the traffic, which turns the roads going in and out of St Tropez into an extension of the town’s carparks. Unfortunately, we weren’t in St Tropez long enough to really get a feel of the place. I think the sheer number of tourists is a real downside. Ok it’s nice to see this infamous celebrity haunt, but you can’t help but feel frustrated that there is a lovely French seaside town underneath the snobby yachts, extortionate boutiques and Italian Ferraris, and it stays just out of your reach. I’m sure further exploration would elicit more amazing things, but to be honest by the time you got to that point you’d be too broke to stay any longer. Staying out of the town and nipping in on a scooter would be the best way to see it, or do what we did and stay in the wider area and visit for a day. You were lovely to see, St Tropez, but unfortunately sitting in a traffic jam to get out for the same amount of time as we spent wandering your pretty streets was not really my idea of a good time. I will, however, always remember the best part: watching the sun set over the mountains across the bay, which made the water under the enormous yachts sparkle. 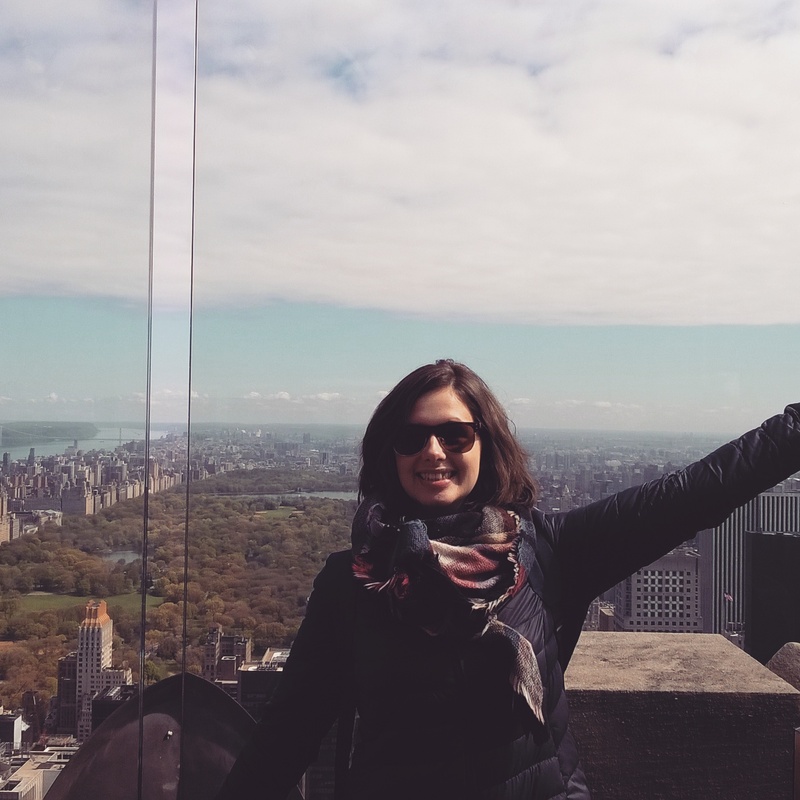 Nice blog, but if I may recommend… Do visit again, but go out of season and see the same beauty without the thronging crowds and heavy traffic. Perhaps late September while the weather is still good. Yes I think I would definitely go again out of summer. However we have been warned it’s a busy place all year round! I’m sure it’s even more lovely when it is quieter.